Independent Female Filmmakers collects original and previously published essays, interviews, and manifestos from some of the most defining and groundbreaking independent female filmmakers of the last 40 years. Featuring material from the seminal magazine The Independent Film and Video Monthly—a leading publication for independent filmmakers for several decades—as well as new interviews conducted with the filmmakers, this book, edited by Michele Meek, presents a unique perspective into the ethnically and culturally diverse voices of women filmmakers whose films span narrative, documentary, and experimental genres and whose work remains integral to independent film history from the 1970s to the present. Independent Female Filmmakers also includes a biographical profile of each filmmaker, as well as an online resource with links to additonal interviews and a sample course syllabus. 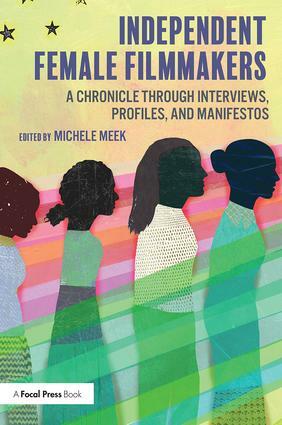 "Michele Meek’s book is a welcome and important addition to the growing list of anthologies about women filmmakers…but what makes it special is that it is about the true pioneers of independent American women’s film, written and edited by those who were part of it." "This is a rich and exciting volume that draws attention to the indispensable contributions that women filmmakers have made to American independent cinema. Featuring profiles of and interviews with many groundbreaking directors, it gives voice to female artists whose experiences will inform and inspire the next generation of image-makers." Michele Meek is an Assistant Professor of Communication Studies at Bridgewater State University. She co-founded Independent Media Publications, which now publishes The Independent, and, throughout her career has worked in film distribution, festivals, media journalism, and as an award-winning writer/director. Her recent essays have been published in Literature/Film Quarterly and Girlhood Studies. For more information about her, visit www.michelemeek.com. Included below are the interviews and profiles from The Independent Film & Video Monthly that needed to be cut due to length and other constraints from Independent Female Filmmakers. We’ve included them here for your additional reference.